I recently received a large canvas from Canvas Design to review. I sent off one of my favourite photos of my two little ones that I took on holiday in Cambridge to be enlarged and put onto canvas. On the computer I couldn't see anything wrong with the photo, I thought it would be no different from any other photo I've had placed onto canvas before but unfortunately there must have been a slight issue with the exposure because blown up, the colour is definitely not what I was looking for. Sadly, I think this was more to do with my not noticing on a small computer screen. I have no idea if anyone looked at my enlarged photo and wondered if the colour of my children's faces should be quite so pink! All that aside, the rest of the photo has the most beautiful, clear colour and you can tell instantly how high the quality is. I have another large canvas from a different company and Canvas Design has done a much better job, even with my slight disappointment included. My canvas is now a center piece in the family room where I can look up from my desk and see my little ones smiling down at me. I would definitely order from Canvas Design, I have not been put off but would, from doing this review, probably double check on my photo editor for the exposure on my chosen photo. You can't always predict what a photo would look like though and I'm always aware of that. 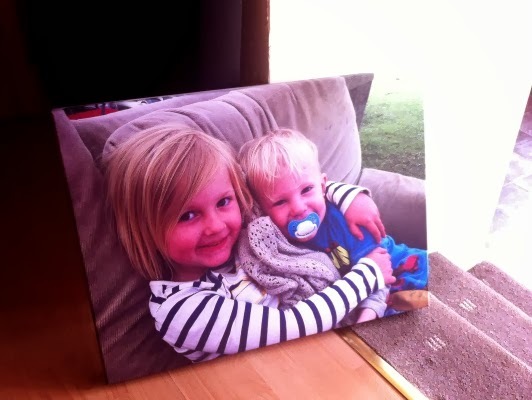 If you'd like to order your own canvas which range from a size 6x6 to 40x40 inches (£7.99 - £60.00 RRP), go to their site here and once you've uploaded your photo and design.